Each time an order from your shop is validated, an invoice is sent out to the customer. This page allows you to configure your invoices and makes it possible to download a selection of invoices. You can download the invoices for a single order from the order’s page. The “Invoices” page enables you to download a selection of invoices from past orders in PDF format, all at the same time (in the same PDF file). By date. Very useful when you need to print all invoices for a given month or a given quarter. Select the start and end date, and click on the “Generate PDF file by date” button in the top bar. By order status. A must-have when you need to print precisely which orders are canceled, refunded or on backorder. Your catalog helpfully indicates the number of invoices tied to each status in parentheses. In both cases, the invoices are generated into a single PDF file, each with their own pages. You cannot get a single PDF file for each invoice of the given period or statuses using this page. If you want to customize the look of your store’s invoices, you must change its template files. PDF template files are located in the /pdf folder. Open the invoice.tpl file and edit it to your likings: it is an HTML file with Smarty tags. 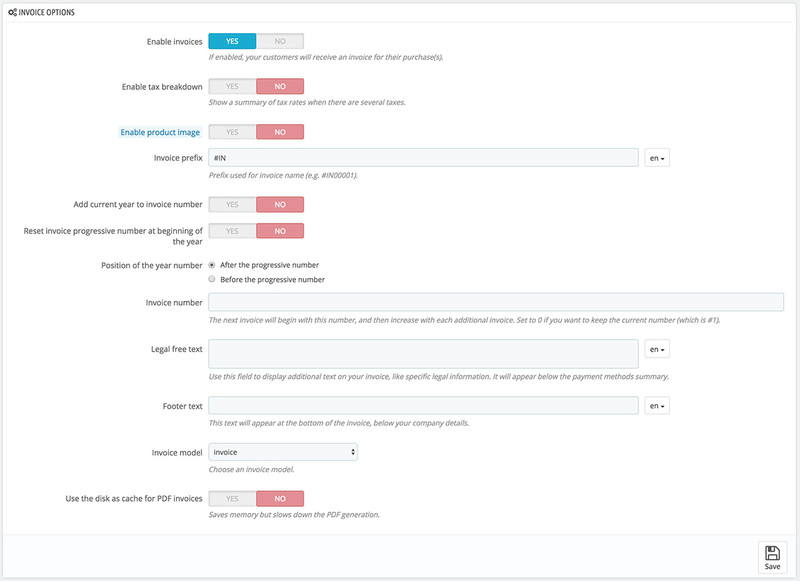 When your customers ask for their invoices, you can redirect them to the “Order History” section of their user accounts, which keeps all of their invoices available for them. You can choose whether or not invoices should be available to your customers as soon as the order is made, as well as the Invoice prefix and the invoice number you want listed on the printed version of the invoice. This feature can help you simplify the management of your account. Enable invoices. When disabled, your customer will not receive an invoice after their purchase. You will be responsible for handling the invoices, if your customers ask for one. Enable tax breakdown. New in 1.6. When enabled, the invoice lists all the various taxes that were applied to the order, instead of just one percentage. Enable product image. New in 1.6.1. When enabled, it will add the product’s image next to the product name on the invoice. Invoice prefix. By default, your catalog has language-adapted invoice prefixes: “IN” in English, “FA” in French (for “facture“), “CU” in Spanish (for “cuenta“), etc. You could choose to have language codes instead: “EN”, “FR”, “SP”, etc. Of course, you can also choose to have a single prefix for every language, or to not have a prefix at all. Your catalog will then generate the invoices number according to you settings: “#IN000001”, “#FA000002”, etc. Add current year to invoice number. In addition to the invoice number and prefix, the year will also appear in the invoice number. Reset invoice progressive number at the beginning of the year. At the beginning of a new year, the invoice number is reset to start again at 0. Position of the year date. Choose where to display the year date in the invoice number, before or after the progressive number. Invoice number. 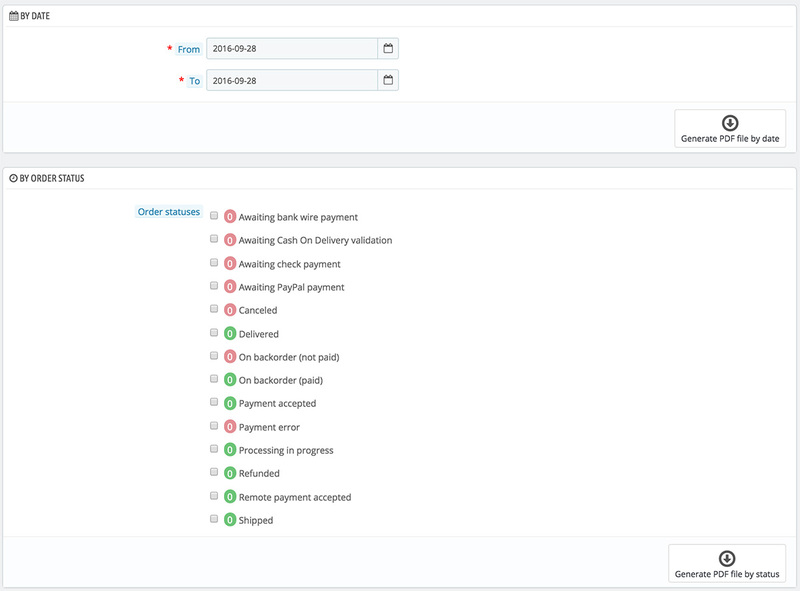 If your business has already had orders and invoices before you started using your catalog, you can use this option to start your invoice number from a higher number. Legal free text. New in 1.6.1.0. This field allows you to add some extra content to the invoice, in case your local legislation require you to display additional information. On the invoice, it will appear below the payment methods summary. Of course, you can use this free text to display any text you deem necessary. Footer text. You can use this to have a custom text at the bottom of all your invoices. The text will appear below the name of your shop in the invoice. Invoice model. Depending on your themes, you might be able to use more than one style of invoice. Test them with a fake order, in order to choose the one you prefer. If you know how to code in HTML, you can add your own invoice models or edit the existing ones: they are located in the /pdf/ folder of your catalog installation. Use the disk as cache for PDF invoices. You can choose to store generated invoices on your catalog’s server disk rather than in its server cache. While it saves on memory usage, it slows down the PDF generation itself, so use it knowingly.